What do you do when you have the kind of friend who welcomes you into her perfectly manicured home with fresh nutty muffins, peach lavender jam and frothy espresso? Obviously, you beg her to let you come over all the time. You also ask her to teach you how to make French macarons, because who else in your life knows how to make such a thing? My friend Victoria and I enlisted Stephanie's help to tackle our first batch of macarons, because I knew she had made them before and we were craving them! Stephanie had made them for Allison's baby shower earlier this year. Victoria and I have both recently been to Paris, and when she went in July she brought me back a box of Laduree macarons to my absolute delight. Ever since then, we've had macarons on the brain. When we walked in, as mentioned above, there were muffins and jam and espresso waiting for us. Victoria and I both agree that Stephanie's house is the model for what we'd like our houses to be (when we grow up!). We had so much fun. By the by, this jam is heaven. It's my new favorite thing. Stephanie made it, and with lavender being one of my all-time favorite flavors, it blew me away. To a very happy place. A lavender peach place. She even gave us both little jars of it to take home with us!! The other day I generously slathered the inside of a honey oat pita pocket and chowed down for a snack. I'm not even sure I needed the pita. First things first: eggs must be room temperature! The kind of expert tips I was eager to learn. Welcome to the age of high-tech cooking. How cute is her hair? Suffice it to say I merely watched, took pictures and ate jam and drank coffee while the real work was being done. Score. We were so excited when the first batch came out of the oven! The other things we learned were that you will ruin it if you overmix or undermix the batter, you have to drop the pan repeatedly onto the counter to release all the air bubbles from the batter, you have to let the batter puddles sit for 20-30 minutes before baking, and the dye lightens up a lot in the baking process so always put extra. While the cookies baked, we sat around the table with some French press coffee and chatted. As you can see, we did some major damage to the jam and muffins. I don't think the day could have been any better! 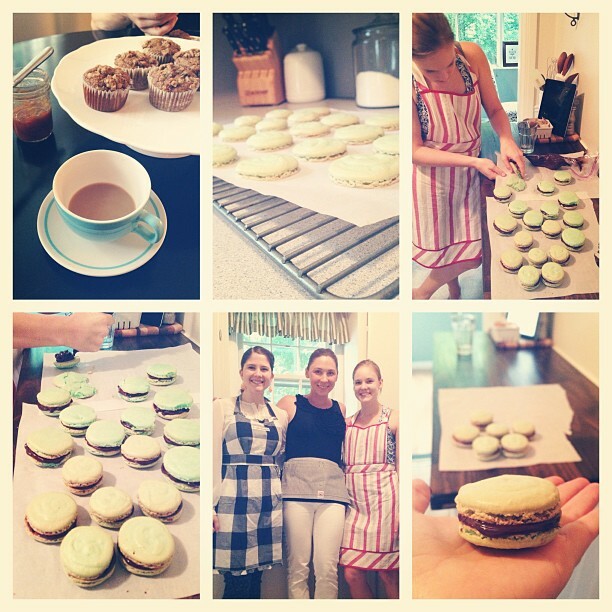 The macaron-madness was settling in. Incidentally, we all wore buns that day. Maybe it's a French thing! 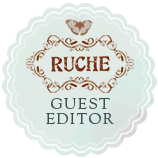 You can check out the recipe we used for the macarons here! Yum! 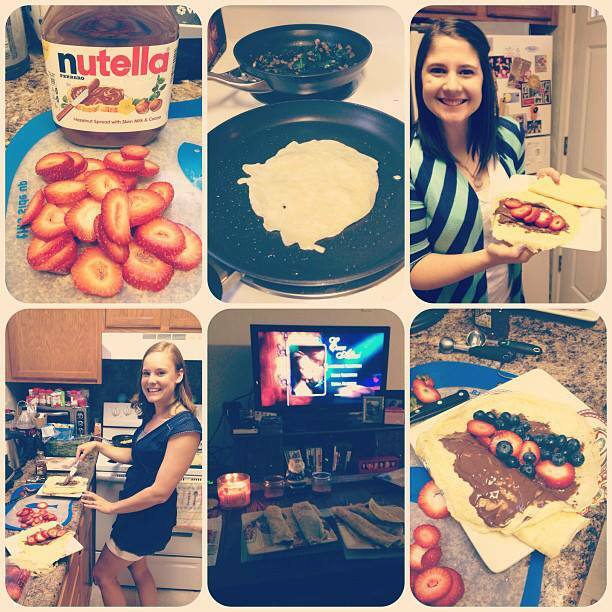 Earlier that week Victoria and I had attempted making crepes, and we watched Ever After. She had never seen it (travesty) so we had a blast doing our best to make a passable nutella-holder, which is all a crepe really is. It was almost as much of a French week as our actual week in France! And I loved it. August has been a wonderful month!